It has been well-established that many of the injustices that people around the world experience every day, from food insecurity to unsafe labor conditions and natural disasters, are the result of wide-scale structural problems of politics and economics. These are not merely random personal problems or consequences of bad luck or bad planning. Confronted by this fact, it is natural to ask what should or can we do to mitigate everyday injustices? In one sense, we answer this question when we buy the local homeless street newspaper, decide where to buy our clothes, remember our reusable bags when we shop, donate to disaster relief, or send letters to corporations about labor rights. But given the global scale of injustices related to poverty, environmental change, gender, and labor, can these individual acts really impact the seemingly intractable global social, political, and economic structures that perpetuate and exacerbate them? Moreover, can we respond to injustices in the world in ways that do more than just address their consequences? In this book, Brooke A. Ackerly both answers the question of what should we do, and shows that it's the wrong question to ask. To ask the right question, we need to ground our normative theory of global justice in the lived experience of injustice. Using a feminist critical methodology, she argues that what to do about injustice is not just an ethical or moral question, but a political question about assuming responsibility for injustice, regardless of our causal responsibility and extent of our knowledge of the injustice. Furthermore, it is a matter that needs to be guided by principles of human rights. As she argues, while many understand human rights as political goals or entitlements, they can also guide political strategy. Her aims are twofold: to present a theory of what it means to take responsibility for injustice and for ensuring human rights, as well as to develop a guide for how to take responsibility in ways that support local and global movements for transformative politics. In order to illustrate her theory and guide for action, Ackerly draws on fieldwork on the Rana Plaza collapse in 2013, the food crisis of 2008, and strategies from 125 activist organizations working on women's and labor rights across 26 countries. 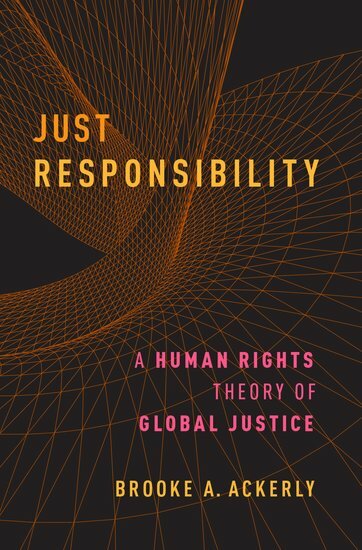 Just Responsibility integrates these ways of taking political responsibility into a rich theory of political community, accountability, and leadership in which taking responsibility for injustice itself transforms the fabric of political life.